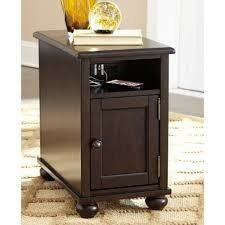 Item Description: Everything's within reach with the compact Barilanni chairside end table. You won't have to leave a seat to charge electronic devices since this stylish companion has two handy built-in USB charging ports, two AC outlets, an open storage cubby and a lower cabinet—perfect for tucking away all your chairside necessities. Its attractive design with smooth dark brown finish is accented with bronze-tone hardware and bun feet for a casual look.